A home for Science, Exploration and Discussions without agendas. 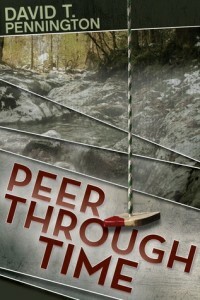 “Peer Through Time” by a new science fiction author David T. Pennington was released in January 2015. Pennington presents to us a future where time travel, seemingly naturally occurring vortex, is a possibility for only a few individuals, and can be a bit unpredictable when one might end up once they enter it. He takes us on a journey through time with a young woman, Carmela Akronfleck, who is trying to save her family by manipulating the past from a killer in the future. I really like the premise of the novel. It is new and a fresh fusion of time travel, treatment of temporal causality, and perhaps inevitability. Pennington did a very good job of weaving characters in and out, forwards and backwards though time. It undoubtedly would have given me a migraine to figure out the story arcs if I were the author, but it is presented in a way that was understandable, easy to follow and believable as he reveals each character’s history to the reader. And if that wasn’t enough, Pennington nicely layers the story with a murder-mystery, action, and a sentient android struggling to find his place in the human world. Time travel, murder, mystery, and androids – it has it all! Well done Mr. Pennington! Get the latest information on latest published books, sales, events and late breaking news! Anonymous on Education is not the filling of a pail, but the lighting of a fire.